Habitat: Garlic is native to central Asia. Now, Garlic is grown all over the world, preferring full sun and well drained soil. Description: Garlic is a bulbous perennial plant growing up to 1 meter in height. It grows from an underground bulb which sends shoots up in the air. Garlic bulb is divided into papery white cloves (their number range from six to twenty). The leaves are long and flat, opposite and erect, with a crease down the middle. Flowers are white and starry. 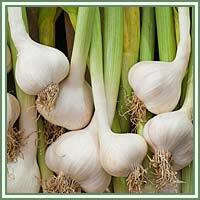 Medicinal use: Garlic has a very long folk history of medicinal use. It is cultivated for more than 5000 years and is considered to be an anthelmintic, antiasthmatic, anticholesterolemic, antiseptic, antispasmodic, cholagogue, diaphoretic, diuretic, expectorant, febrifuge, stimulant, stomachic, tonic and vasodilator. With these properties, it is considered an extremely beneficial medicinal plant. 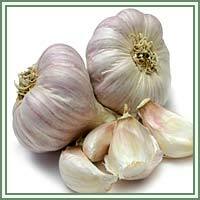 Garlic is very helpful in cases of bacterial and fungal infections. It can be helpful in cases of ringworms, candida, vaginitis and thrush. It helps detoxify our body and suppresses the growth of certain tumors. Garlic is also an excellent antioxidant, and can help prevent heart disease. It is also considered helpful in lowering the blood pressure, cholesterol levels and in regulating blood sugar levels. In addition, Garlic can slow the development of artheriosclerosis and act as a powerful antiseptic for treating wounds.